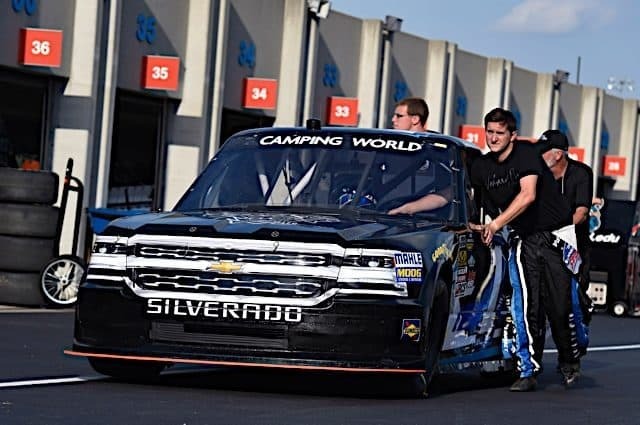 In an era when sponsorship dollars determine how successful a NASCAR driver will be, Jordan Anderson is one example of a creative thinker in the garage. The Camping World Truck Series regular is in the midst of his third season running the majority of the schedule. 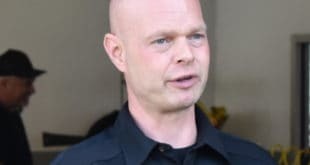 The task is not only an expensive one, but includes a mentally and physically grueling job as he attempts to make it to the show. Frontstretch spoke with Anderson over-the-phone a few weeks ago, discussing his presence on social media, crowd-funding, building his own program and making the most of each small opportunity presented to him. Joseph Wolkin, Frontstretch.com: How important is social media in your efforts to compete in NASCAR? Jordan Anderson: Social media has really been the backbone of our program this year because when we had our crash at Atlanta earlier in the season, that was it. Our season was done. I had to either race another truck or raise funding to go race again. We had the Fueled by Fans program at New Hampshire last year to get another motor, and I never thought it would work again. The response we got on Twitter and Facebook and Instagram was just so humbling. We had some momentum going because of all this. Fast forward a month later and we were at Kansas Speedway with sponsorjordan.com on the truck, and we went on to finish 19th that night. We went from nearly having our season over to having a top-20 finish. We’re in the top 20 in points, and that’s because of the fans staying engaged with me and the journey I’m on. I’m just an old-school racer trying to be the people’s driver, working hands-on. I want to give them insight of what I do to get to the racetrack every week. My program would be nothing without the fans, and that’s why it’s so special for me to stay connected with them and update them with everything we’re doing. Wolkin: For fans who have been trying to help you out, what’s in it for them? Why should they donate money to you over any other cause? Do you ever feel a sense of guilt? Anderson: No, and that’s really why a crowd-funded type deal wasn’t nearly something with no return. They were basically sponsoring my truck, so it wasn’t donating money with no cause. If you had a $20 slot to a certain amount, it went from having your name being hand-written on the truck to a five by five logo to a 10 by 10 logo to a 15 by 15 logo. It was basically an opportunity for fans to sponsor a racecar. It was a way for me to connect with my fans. Whether it was a $20 deal, $50 deal or a $500 deal with the sponsorship program, I hand-wrote every single person’s name on that truck. We had somewhere over 250 names. I took a white decal, a Sharpie and hand-wrote every one. The cool thing is I knew the name of every single person who helped me get to the racetrack. At Kansas, Charlotte, Dover and other tracks, some of the fans had hot passes and went to autograph sessions, and they would come up, tell me their name and immediately I went, ‘oh yeah, you were on the truck.’ It was just so cool because they weren’t donating with no return. They were actually a part of my program. It was cool to have them as part of our team. Wolkin: Now that you guys are back on track, what are your expectations for the remainder of the Truck Series season? Anderson: We’re definitely a throwback to how racing used to be. We don’t have a big shop. We don’t have a big hauler. We have a dually and a 40-foot trailer. We have one of our sponsors giving us a dually to pull our trailer with. Moving forward, if we can keep matching our results with this truck, it would be good. I have to be a little bit of a different driver than if I were with ThorSport or KBM, which have lots of trucks and plenty of manpower. When I go out there and knock the ride side off the thing or take the right-side suspension off, it’s me and a buddy or two who has to put it back together. From a driver’s perspective, it makes me respect my equipment and the other drivers’ equipment. If you want to finish the race, you can’t go out in the first 10 laps and drive crazy. If we can get top 20s and top 15s and add an additional truck to our fleet and have two trucks, I think that would be a huge result for us. The last two years, I’ve managed to finish in the top 20 in points and if we can match that again for the third year in a row, it would be incredible. Wolkin: The Truck Series field is getting lighter, so how do you market that you’re finishing in the top 20 when there are smaller fields? Anderson: I think whether you have a full field or have 45 trucks or have 18 trucks, it’s still NASCAR and it’s still a national series. I grew up racing Legends cars, where there were 80-car fields. There’s nothing harder just to get to the racetrack than NASCAR. It’s so hard to get to that level, whether it’s through building a truck, finding a crew and getting a motor. That’s why I tell my fans to keep things in perspective. For us, our victory is just getting to the racetrack some weeks. It’s hard to put into words the amount of effort it takes to get to the racetrack. I’ve been very fortunate over the years to build relationships, and that’s the one thing that makes everything click is people. Us getting to the racetrack isn’t from one thing Jordan Anderson has done. It’s all of the people who have helped us along the way. With me building the truck, we’re able to get it to where it runs the whole race. We had a motor blow at Dover, but other than that, we haven’t had any mechanical failures all year. The thing we have going for us is having a driver that people can root for. I don’t have a 10 or 15-person crew that is building trucks. It’s just me and a few friends. I buy them pizza and we work late nights in the shop and do what we can. It’s a throwback to what the sport was built on, and it’s cool people can relate to that. Wolkin: This year, you’re back on your own. How difficult is it to be in your 20s and running this operation basically by yourself? Anderson: I love it and I love the opportunity to be at the racetrack. I went to Belmont Abbey College in North Carolina, and I have a degree in business management with a minor in marketing. This is what I went to school for – running a team, handling sponsorships, people, keeping the books up, making sure you have enough money to go week-to-week, buying parts, making sure you have enough fuel to get to the racetrack, getting hotel rooms and all the logistics that go with it and there’s a lot more that goes into it. The hard work and the late nights in the shop is rewarding. When you’re in the race shop, working at 3 a.m., you have a lot of thoughts running through your head. When you get to the racetrack, pull in there and compete in a series that’s as prestigious as NASCAR, that’s a reward in itself. I love it and I’m very blessed to have the opportunity to do what I love to do. I told my mom and dad I want to be a NASCAR driver when I was four years old and here I am 20 years later, and it’s amazing. Wolkin: You’ve been able to run some XFINITY Series races this year. What do you feel like you’ve learned that’s helping you in the Truck Series? Anderson: The seat time is huge. I got to go to Auto Club Speedway for the first time earlier this year, and we went to a lot of these places that was just with XFINITY, but we’re going to go back with the trucks later this year. I did a start and park deal for Ryan Sieg earlier this year, and it led to the opportunity to drive for BJ McLeod at Dover. We were running 16th with 10 laps to go and had a right rear shock break on us. We still finished 24th, and hopefully, people noticed how we were running before that happened. The more you can get your name out there and the more people can see you on the racetrack, doing the best with the equipment that you have, is my goal every time I get to the racetrack. Wolkin: What’s next for you with only a few months left in the season? Anderson: The main focus right now is running the rest of the truck schedule. The goal is to run the Truck Series all the way through Miami. We want to finish as high up in the points as we can. If can finish in the top 15 in points, it would be a huge accomplishment for us, especially since we missed Daytona. That would be a great year. I’m always trying to get into a XFINITY car. I’d be lying if I didn’t say I had my eyes on getting in a Cup car in the near future.